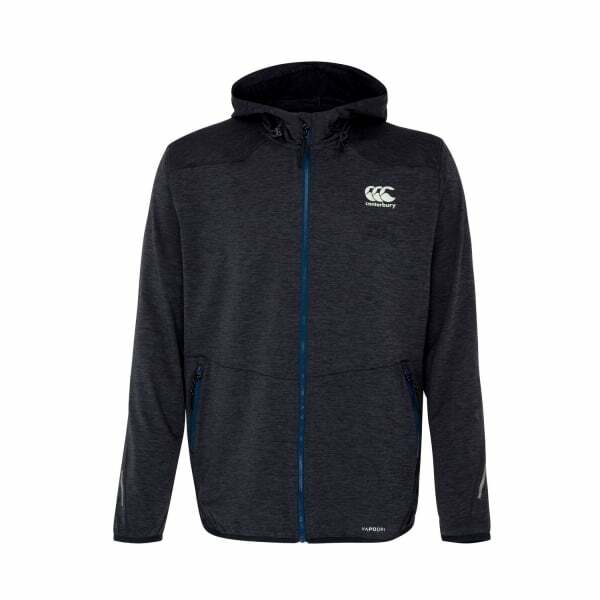 Designed to be worn all day long, and for all activities, this versatile 88% polyester, 12% elastane hoody is comfortable, flexible, and stylish. Features VapoDri technology to quickly absorb and evaporate sweat, too, keeping you dry while working out. You’ll love wearing the VapoDri FZ Hoody to training sessions, when out and about, and when relaxing at home. It’s comfortable; featuring a premium 88% polyester, 12% elastane blend, and all of Canterbury’s expertise in making clothing for cold weather. It’s also highly practical for sport and training, with VapoDri technology helping to keep your body cool and comfortable by wicking sweat off the skin, and forward facing side seams to maximise flexibility and stretch. There are even reflective details, so you can use this in low light and feel safe, knowing that others can see you as you work out or cycle in the dark. Available in sizes XS – 4 XL.